If you’re looking for a timber frame structure, we work across Western Canada, as well as further afield…wherever you may be! Are you a home owner looking to renovate or build? Would you like to speak to someone for their suggestions, advice, or get an idea on budget involved in your project? Or perhaps you are a commercial construction company who wants to work with a timber framer who understands the entire build process and whom you can trust to deliver a product that showcases your construction expertise on time and on budget. McLeod Creek Timber Frame is always happy to discuss with you your ideas, plans and dreams for your new timber frame home or structure. We are glad to answer any questions you may have about our products, and advise on what we can supply to help toward the fulfillment of your plans. Please contact us through email, by filling out the form below or phone us anytime. If you would like some help getting started right away, we can send you a PDF with a design questionnaire on it that will help us help you. 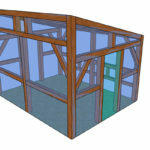 Additionally, if you would like to learn more about timber frame construction and all it’s aspects, along with alternate forms of tie-in construction, we can also send you a PDF list of resources that will enable you to become familiar and educate yourself with your project and all that is involved. Would you like a design questionnaire? Would you like a list of timber frame or alternative construction references?